Our panorama view of the Kirchenallee in Hamburg depicts (from right to left) the Deutsches Schauspielhaus (“German Theatre”), the Hotel Continental, the Hotel Reichshof and a business building on the corner of the street Lange Reihe. This street block is situated in Hamburgs St. Georg quarter, directly opposite the main station of Hamburg. The Deutsche Schauspielhaus was established on the initiative of Hamburg citizens and was built in 1899/1900 by the Vienna based architects Fellner und Helmer. 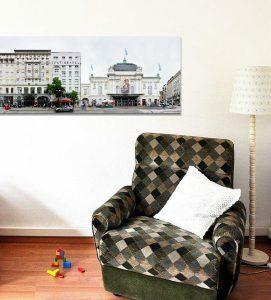 As a role model the neobaroque Volkstheater in Vienna by the same architects was used. With 1.200 seats it is regarded the largest Theatre/Playhouse of Germany and one of the most influential as well. The Hotel Reichshof was errected 1906-1910 and run by Anton Emil-Langer. Its architect was Heinrich Mandix, who designed it in reform style with baroque and classical elements. Then it was regarded the biggest hotel of Germany. In 2014 it was refurbished and is now described as a Art Deco Design Hotel in the style of the golden 20s. Next door we find the six-storey Hotel Continental Novum which was built in 1913.